Herbs are such versatile plants. They can be used in foods and teas or as part of your landscape. The Growing Place has over 100 varieties to choose from. They can be grown in containers or in the ground. When harvested they can be used dried or used fresh. There are hundreds of ways and reasons to grow herbs—even the insect world uses herbs. 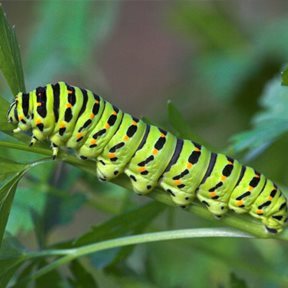 Many butterfly species use herbs as host plants for their caterpillars. 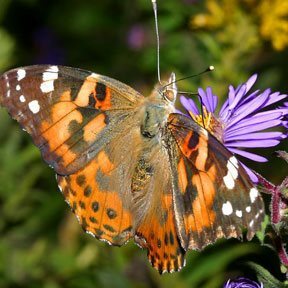 This spring we’ve already spotted some Eastern Black Swallowtails and Painted Ladies. 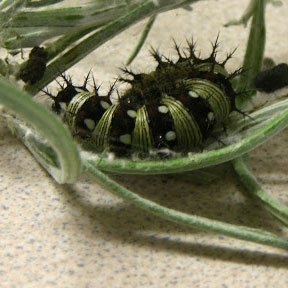 Painted Ladies are another caterpillar that will munch on herbs. At The Growing Place we’ve seen them gobbling up Ornamental Curry but they can use several other types of plants as host plants. Some of their favorites include thistles, hollyhock and mallow, and various legumes. Once an adult butterfly emerges from its chrysalis they feed on flower nectar and are usually less selective than their caterpillar counterparts. Many herbs are great plants for butterflies and other pollinators because they have tubular shaped flowers or umbels. Today’s plant biology lesson: Umbels are flowers that are made up of a number of short flower stalks that spread from a common point, almost like an umbrella. Plants like nepeta and agastache have more tubular shaped flowers while plants like chives have umbel flowers. Think of the umbel shaped flowers as an “all you can eat buffet”. A butterfly (or other polinator) can land on one flower and find their appetizer, main course and dessert right there! 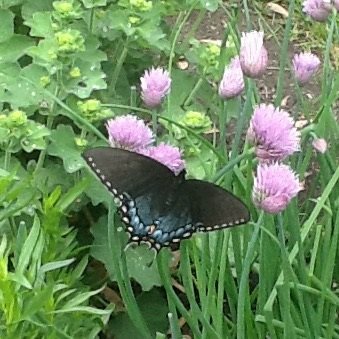 When flowering parsley, dill, and fennel also provide nectar sources for butterflies as well as being a host plant for caterpillars. Thyme is another herb that butterflies will use as a nectar source. So go forth and plant herbs! Just remember, the caterpillars will most definitely find them. A few holes in the leaves is a small price to pay for the beautiful butterfly or moth that will follow!